While many classic gaming compilations are rather stingy and only put out a handful of titles, Atari Anthology for the PS2 takes a different route, offering a more than 80 classic home and arcade games to choose from. The majority of these games are timeless classics that have withstood t he test of time. From simple yet addictive 2600 titles like Doge 'Em and Yars' Revenge to the more sophisticated arcade hits like Red Baron and Battlezone, there's something for every taste. The selection is broad and deep, and the games shine thanks to the excellent emulation that recreates the original games almost flawlessly. This outstanding pack is a great value that should please classic game fans. Even though the gaming world has undergone several seismic events in the two decades since their release, this collection of Atari's classic titles still maintains its appeal after all these years. Featuring 18 classic arcade games and almost 70 classic 2600 titles, Atari Anthology for the PS2 is about as comprehensive an overview of the classic games as one could expect. The games themselves offer a nice variety of genre and style. As you'd expect, Atari's first video game and the first commercially successful coin-op, Pong is included in all its glorious simplicity. Other early classic titles such as Super Breakout show electronic gaming in its earliest prime, with addictive gameplay more than compensating for their now-primitive graphics. The compilation goes on to include some of the biggest hits including Asteroids with it's beautifully streamlined play, ominous bass soundtrack. It's sequel, Asteroids Deluxe offers more variety of enemies and some new options such as hyperspace jumps, but the added complexity makes for a more challenging game. Missile Command's cold-war era plot may seem a little dated these days, but the frenetic later levels still offer plenty of reflexive challenge of the type that seems sorely missing in today's cinematic titles. Centipede and Millipede have likewise held up well, with the same addictive mushroom blasting gameplay you remember. While shooting the mushrooms and splitting up the centipede are still the main goals, mastering the art of getting the spider before it crashes into you is what makes the gameplay remain so vexing. 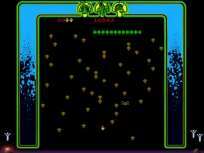 Play Centipede first, since it lets you master the basics, and further appreciate the additions in Millipede. The vector-based Battlezone remains one of the most sophisticated games from the classic era. Its technical excellence is apparent with its on-screen radar and tense atmosphere, making this title feel strangely futuristic and far ahead of its time. The gameplay is tightly wound anticipation, awaiting the moment other tanks materialize on the field. With it's beautifully designed 3D approach, minimalist design and intense action, Battlezone's sleek vector graphics still create one of gaming's best military themed titles. There can be little argument that Battlezone is a timeless classic, many younger players may not be aware of its spiritual companion Red Baron. Another 3D vector based shooter, this title feels surprisingly similar, but has a unique approach. The vector goodness continues with Space Duel, a sort of updated Asteroids with color vectors, stylish geometric enemies and a unique dual-ship design that gives the game a unique feel. Going back a little bit in time, the early vector effort and more cerebral Lunar Lander might not make much of an impression these days, but its challenging thrust and gravity gameplay is quite enjoyable, and makes a nice precursor to both Major Havoc and Gravitar, which both had similar physics themes in their underlying gameplay. Of these, Major Havoc is the more accessible, sort of an odd mix of what would now be classified as platforming with some shooting action. Gravitar is much more challenging than you probably remember it, with multiple mini-games requiring a great deal of skill. It's not the easiest game on the arcade portion of the disc, but it remains quite challenging. Finally, Atari's classic Tempest is included, and is probably responsible for more lost hours than any other game on this compilation. Tempest's supercharged, electric gameplay remains some of the most intense and addictive ever designed. It's simplicity is deceptive and the ever changing playfields represent just one of the elements that make Tempest one of the greatest shooting games ever devised. Atari's inclusion of the special Tempest Tubes modification adds to this compliation's value. There are also a couple of more obscure titles included such as the cult-favorite Black Widow, a kind of vectorized Robotron and Liberator, a cool Missile Command variant that features characters from the old DC Atari Force comics. The always charming Crystal Castles also makes an appearance in Atari Anthology, with the game's advanced 3D playfields, crisp visuals, great animation and disarming music giving it lasting appeal. Overall, the arcade portion of AA is superb, offering almost completely accurate and faithful emulations that definitely brings these classic games back to life. The excellent selection gives players an excellent overview of Atari's coin-op heritage with hits, classics and obscurities offered in abundance. There are still a few more titles that haven't come out yet (Aladdin, anyone?) and some of the earlier games (such as the original Sprint, some of the pong variants and the classic trackball-based arcade Football) aren't included, but the selection here is still satisfying. While the disc offers a decent selection of arcade games, it's absolutely jam packed with Atari 2600 titles, making this the most comprehensive part of the pack. Many of the early 2600 (or VCS) titles such as Combat, Air-Sea Battle, Canyon Bomber and Outlaw seem really primitive, even by the standards of later 2600 releases. However, they're still loads of fun to play despite their limitations. Two of these are the always fun Miniature Golf and the surprisingly addictive racing title Dodge 'Em. Players can also rediscover the simple joys of games like Sky Diver and Slot Machine, two favorites that remain as fun as they ever were. Many 2600 have a kind of quaint charm that remains appealing today, making them more than nostalgia pieces for a generation of gamers. Some of the earlier titles such as Night Driver and Flag Capture still have a high degree of replay value that lets them transcend their technical shortcomings. A good example of ingenuity winning out over technology is Adventure, one of the earliest RPG style games ever released, it was remarkable for its complexity, hidden secrets and incredibly challenging gameplay. Another excellent "Adventure" style game on the system is the under-rated Haunted House, with it's multiple floors and complex puzzles making it a surprisingly challenging game. Later on, Atari began to release some really solid arcade to home translations that couldn't match the graphics of the original games but equaled them in gameplay. Some of these, such as Warlords were probably more popular on the 2600 than they were in the arcades, while others like Asteroids brought the gameplay experience home in acceptable translations. Later on, the gap became a bit too large to ignore, with later releases such as Battlezone and Crystal Castles offering scant resemblance to their arcade releases. However, even these translations had their moments, with Battlezone's cool scrambled screen showing a new level of technical expertise on the system. Some of the 2600's original games, like the immensely addictive Yars' Revenge have held up surprisingly well, and remain as addictive and enjoyable now as when they came out more than 20 years ago. During its heyday, the 2600 offered something for everyone, including a variety of video table games such as Video Chess, Video Checkers, Backgammon and several gambling games such as Casino, Slot Machine and Blackjack. Other more traditional gaming staples are represented on the console including the memorable and addictive Video Pinball, Bowling, Atari Video Cube (based on the infamous early 80's sensation Rubik's Cube), and the always popular 3D Tic-Tac-Toe. There are also a few educational games on the compilation such as Fun with Numbers and Demons to Diamonds and Math Grand Prix. Sports fans also have a nice selection of titles here including early attempts like Football, Home Run, Circus Atari, and Golf. Atari's Realsports line offered improved graphics with Baseball, Football, Volleyball and Tennis offering surprisingly sophisticated gameplay. Game collectors will also be happy to see some of the more obscure titles in the 2600's library such as Radar Lock, Quadrun, Steeplechase, Stellar Track, Submarine Commander included. Atari has also included some late releases like Off The Wall, Sprintmaster, Desert Falcon and Double Dunk along with the extremely rare SwordQuest: Waterworld on the disc. This is quite an enormous selection of titles, covering a large swath of the 2600 library, but there are some major omissions, largely due to licensing issues. This is why famous and infamous 2600 releases like ET, Raiders of the Lost Ark, Pac Man, Ms. Pac Man, Space Invaders and more haven't been included. It definitely leaves a large gap in the library, but the games that have been included remain excellent. As far as technical standards, the emulation of these 2600 games is excellent, with many looking and sounding identical to their real counterparts. This has been a problem with some recent comps, but not here. The games control well with the PS2's standard dual shock controller, with the analog sticks making good substitutes for the paddle controllers. In addition to standard ports of the games, players can unlock special enhanced or different modes such as a trippy mode which blurs the graphics, double speed modes, time attack modes and some where the games change randomly. Players can also view historical information, such as fliers and catalogs in the game's large archives, which cover almost every game. Finding and selecting the games themselves is easy thanks to the sleek astrological interface, which allows you to fly around and select the games from themed areas. Overall, Atari Anthology is a solid release that should please classic fans with a wide selection of titles that covers most of the major games on the platform. The emulation on both the arcade and 2600 portions is excellent, and remains faithful to the arcade originals. An almost identical compilation was released for the PC about a year ago, and we're happy to report that Atari Anthology is just as good in terms of emulation quality and selection. This is an excellent addition to any PS2 library, and an essential purchase for classic gamers everywhere.